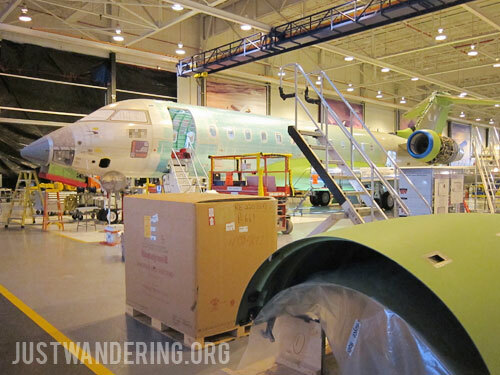 Aside from taking us to Toronto, Philippine Airlines also took us around to see the attractions around the city. First stop was just in the neighborhood: the old and new City Hall. The Old City Hall on the corner of Queen and Bay streets is actually the third city hall, and was designed by architect Edward James Lennox. Done in the Romanesque Revival style, it was a huge building with a towering clock uh, tower. Our next stop held much excitement for many members of our group. 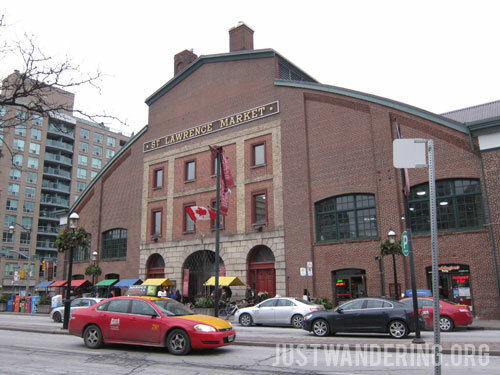 It was at the St. Lawrence Market, a.k.a. home of many awesome and yummy things. 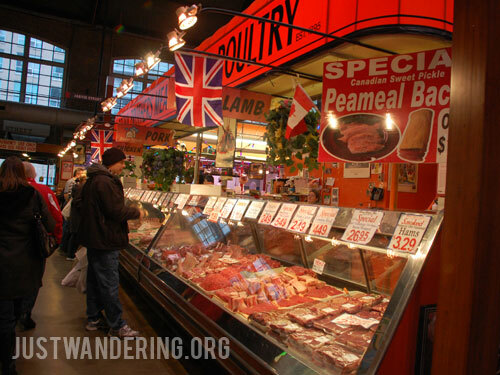 We were welcomed with shops selling souvenir items (and cold weather accessories), and further on, there were stalls that sell all kinds of meat, seafood, vegetables, and lots and lots of cheese. It was a good thing I haven’t had a chance to change my money to Canadian dollars yet, or I would have made some serious damage. Right across the main building is the Farmer’s market, where local producers sell their goods. It’s not as pretty as the South Market, but it’s where the locals shop, and actually feels more homey. 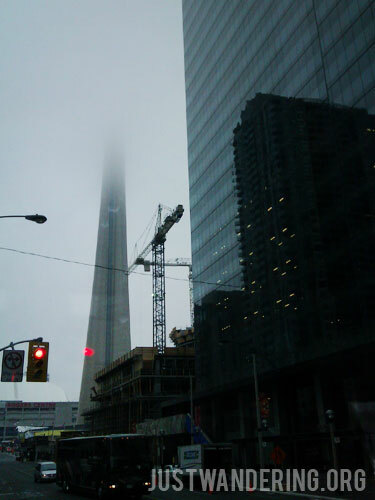 We headed to CN Tower for lunch, but based on the view we’ve been getting of the tower since that morning, the view up top would be disappointing. The tower disappeared among the clouds, and the view from our table was an endless sea of white. One group who went to the tower on a clear day said the view was spectacular. I’ll take their word for it. On the second day of tours, we headed to more heritage buildings. Toronto has no shortage of old buildings and what’s impressive about it, is that it is able coexist with the modern skyscrapers. 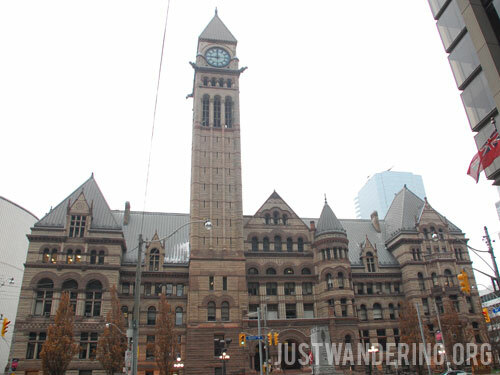 It was a joy to walk around downtown Toronto and see all these pretty buildings. 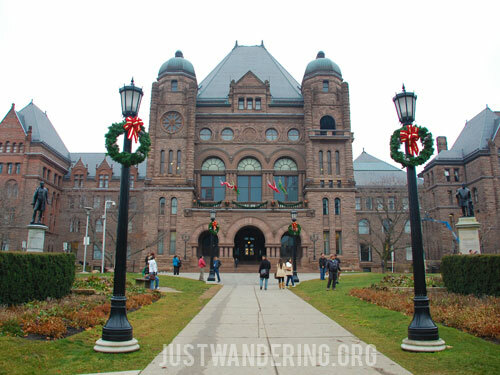 Our first stop was the Ontario Legislative Building, followed by the University of Toronto, both located in Queen’s Park. 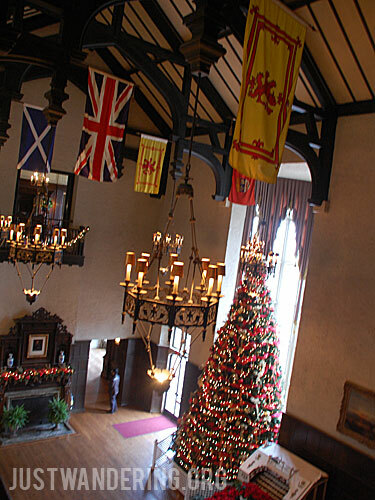 We headed on to Casa Loma, the former home of Sir Henry Pellatt, a once successful businessman. He commission architect E.J Lennox, who also designed the Old City Hall, to design and build the castle of his dreams. 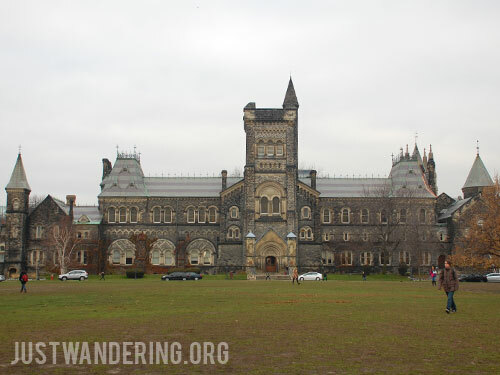 Construction began in 1911, and finished three years after, costing Sir Henry Pellatt $3,500,000. 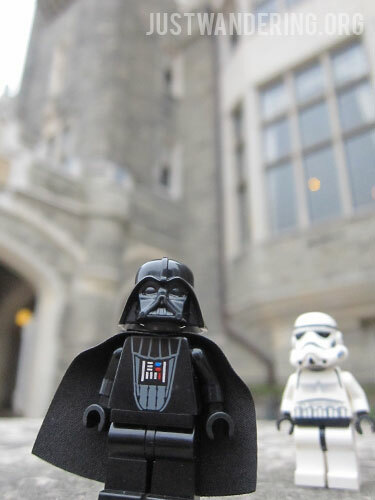 When he lost his fortune, Sir Henry and his family moved to a farm and Casa Loma was abandoned. It was turned into a hotel for a short period of time, until it was operated as a museum. Though missing a moat, it’s as romantic and grand as you’d imagine a castle would be, with ballrooms, stables, rose gardens, secret passageways and a 800-foot tunnel. The following day, we headed out to Niagara. We passed by the town of Niagara on the Lake, a picturesque town that we deeply regret not being able to explore. It was just too pretty. Of course, the main event of that day was Niagara Falls. Comprised of three falls: Horseshoe Falls, the American Falls and the Bridal Veil Falls. 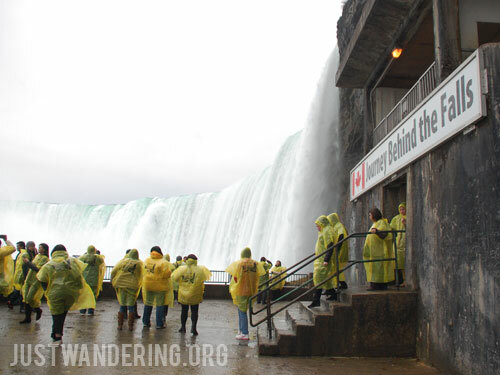 The last two is in the US side of the gorge, while the biggest, the Horseshoe Falls, is in the Canadian side. The sheer volume of water flowing down creates a thick mist that it’s hard to tell whether it’s just mist or it’s already raining. At the Journey Behind the Falls tour, each guest is given a plastic raincoat that they can wear so their clothes can stay dry. Aside from the view deck on the side of the falls, you can also walk behind the falls to feel the power of the water rushing down. This trip was courtesy of Philippine Airlines. They have a brand spanking new (and pretty) site, where you can book your flight, check-in, or check flight status. Visit them at philippineairlines.com. To stay updated on their latest promos and announcements, follow them on Facebook and Twitter. I love those kinds of buildings that they have there. And that town! Like it has so much character. They’re so beautiful Kat! As in ang dami, even the houses! It’s really impressive how they managed to preserve them and keep on using them to this day! Best of all, Downtown Toronto is completely walkable! Been meaning to make a trip up there, since I’ve got family in Toronto who’ve been nagging me to visit. Luckily, you’ve given me a mini-tour, so I sort of know what to set my sights on if we do make it up to the city! Also, I’ve heard that the Canadian side of Niagara Falls is infinitely better than the U.S. side! HAHAHAHA…! I wish you had better views of the tower though. Oh yeah, what goodies did you spend your money on? I wanna see your haul! Go! 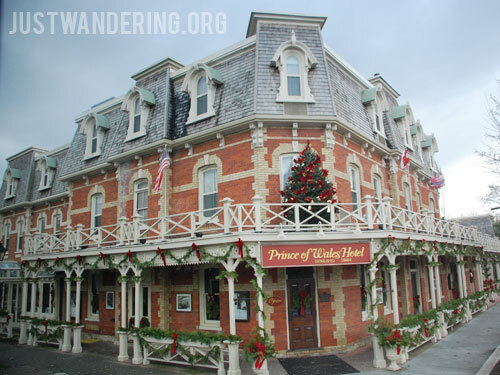 More than just seeing the falls, you really have to check out Niagara on the Lake. So so pretty. I am seriously trying to convince Jordan to go to Toronto this year, but he’s telling me that it’s too cold. Still going to try though. 8.5 hours, if we drive, so it’s doable. LOL…I don’t blame you on the gadgets. Niagara Falls is prettier from the Canadian side! And you’ll be passing by Niagara on the Lake on the way to Toronto! Such a pretty town. Be sure to head out to Toronto Islands too! I’ve been wanting to travel to Toronto since I was a kid. I’ve been to Canada when I was younger for a ski trip but I’ve never had the opportunity to truly experience everything the city has to offer. After a trip to the passport office, I’m sure I’ll be on my way to see the Falls, CN Tower and general sightseeing in the city of Toronto! Can’t forget that glass floor on CN Tower, para kang hihigupin pababa! The view is truly great from up there. Buti na lang at di nyo na-miss ang Niagara. The Canadian side is better in terms of view. Di na kayo nag-Maid of the Mist? I agree. The view from the glass floor sa CN Tower ay katakot! and the kids were even jumping all over it. Hello Nina.. Can I ask how to get Canadian Visa? Is it the same as Australian na puede thru travel agency lang? Or need pa ng appearance. I followed your blog about Australia and went their last year. Another thing, how can you you become a member of Pinoy bloggers. I just want make contacts with them and exchange ideas specially Visa-related and accommodations things. The Pinoy Travel Bloggers group is open to active travel bloggers. Look for the group in Facebook and request to join.